The study was launched with sponsorship by Apple Inc. in November 2017 to determine whether a mobile app that uses data from a heart-rate pulse sensor on the Apple Watch can identify atrial fibrillation. The condition often remains hidden because many people don't experience symptoms. 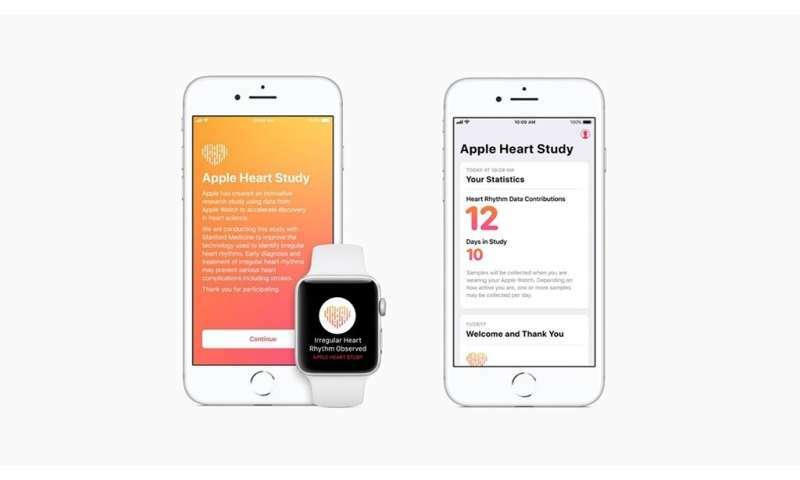 "The results of the Apple Heart Study highlight the potential role that innovative digital technology can play in creating more predictive and preventive health care," said Lloyd Minor, MD, dean of the Stanford School of Medicine. "Atrial fibrillation is just the beginning, as this study opens the door to further research into wearable technologies and how they might be used to prevent disease before it strikes—a key goal of precision health." For the study, each participant was required to have an Apple Watch (series 1, 2 or 3) and an iPhone. The most recent Apple Watch, which features a built-in ECG, wasn't part of the study, as it was released after the study's launch. The Apple Heart Study app intermittently checked the heart-rate pulse sensor for measurements of an irregular pulse. If an irregular pulse was detected, the participant received a notification and was asked to schedule a telemedicine consultation with a doctor involved in the study through American Well. Participants were then sent ambulatory ECG patches through BioTelemetry, which recorded the electrical rhythm of their hearts for up to a week.